SwimFest is the annual swimming event organized by NTU Lifeguard Corps, to promote the benefits of safe water sport participation and swimming for a healthy lifestyle among participants. It also creates a wonderful opportunity for swimming enthusiasts to gather, form teams, and challenge their limits. 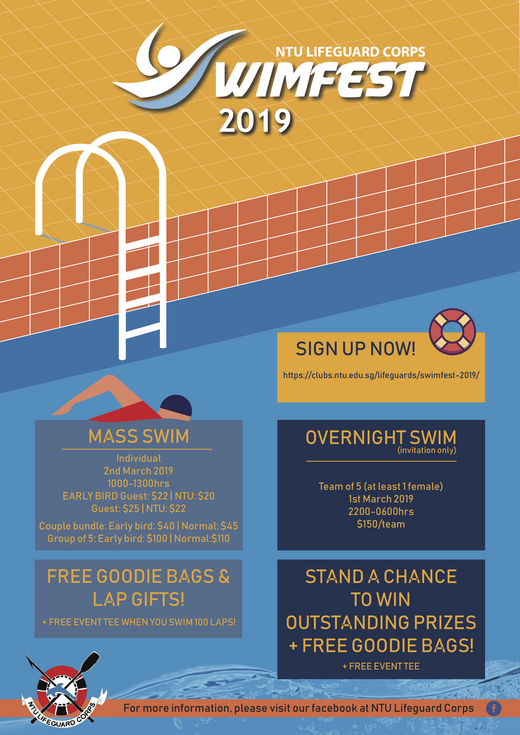 Volunteers are required on the 2rd of March 2019 (Saturday) from 9am-1pm, to give out rubber bands which will serve as lap counters for the mass swim event. CIP hours (4) can be clocked if required. Volunteers will receive a free goodie bag and an ‘official’ event shirt tee, alongside snacks and drinks during the event itself. More details will be provided later on the rotational shifts, after sign ups!